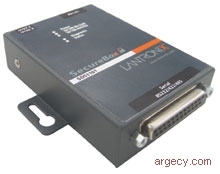 The SecureBox" SDS1101 offers the most secure way to add formerly isolated electronic equipment to the Ethernet network. With this capability, virtually any device with a serial port can be remotely accessed and controlled securely over the network or the Internet. This adds an unprecedented level of flexibility and efficiency to your business, and breathes new life into your existing equipment. With the proliferation of information in today's electronic world, businesses are more concerned than ever about network security and protecting data from unwanted intrusion as it is transferred over a network or the Internet. The SDS1101 single port secure device server features the most robust security available on the market with a National Institute of Standards and Technology (NIST) certified implementation of 128-256 bit AES (Advanced Encryption Standards; Rijndael) as specified by FIPS-197 (Federal Information Processing Standards). SecureBox SDS1101 can also work with Lantronix's Secure Com Port Redirector (SCPR) software to extend the functionality of COM port-based Windows" applications across Ethernet. SCPR creates encrypted virtual COM port connections to transport data to a remote SecureBox over the network or the Internet. This provides secure access and control of COM port-based applications from anywhere, at any time.